With our King season over on Tuesday and the Kenai River sockeye run in total failure it's time to move on, we're going silver and pink salmon fishing, my favorite. 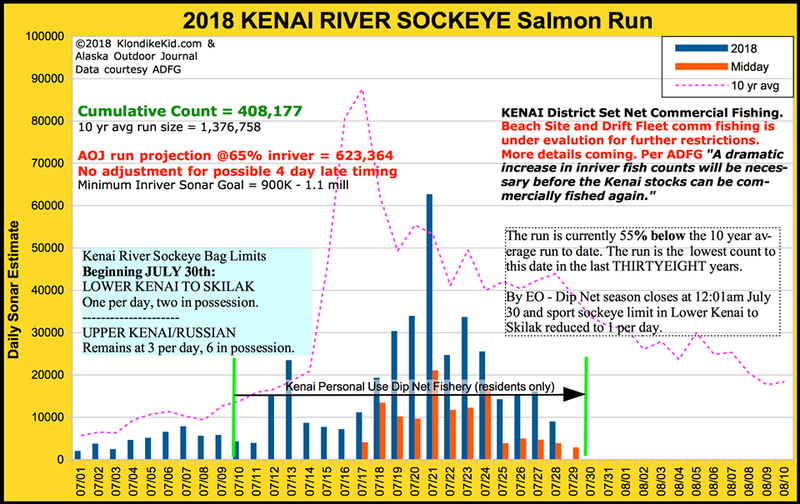 With all net fisheries on hold until Kenai Sockeye escapement is met I think people will be surprised at how many Coho's get into all the rivers. So humor me a bit here as I show you the graph that pretty much tells the tale of yet another fisheries disaster in the State. The commercial fishery is totally closed and common sense says it should stay closed for the remainder of 2018, even if a few reds show up over the 900,000 escapement goal one thing we're learning is that this fishery is so powerful it could really put a a dent in all the other fisheries. 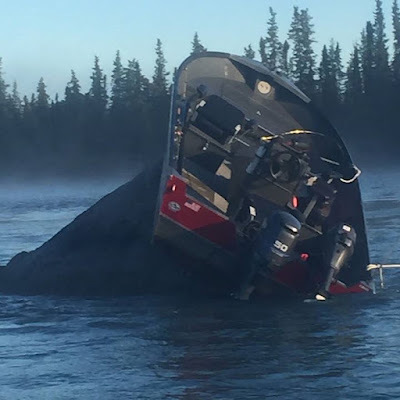 Of course the sport fishing has been reduced to just one red a day and Alaska's favorite fishery the personal use dip net fishing has been closed as well....but not soon enough for our commercial neighbors who are hollering that it's unfair if people fish when they don't. 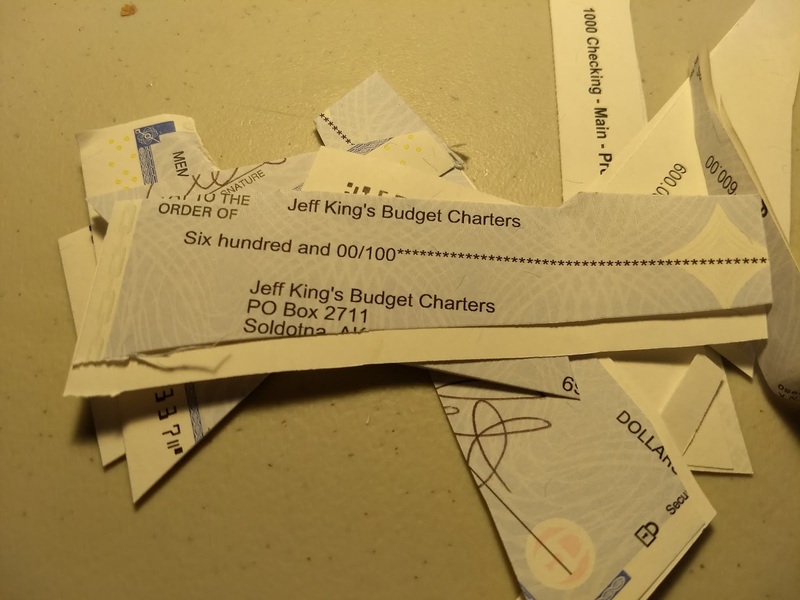 Never mind that we deal in dozens or hundreds and they deal in thousands or better yet millions....it's one of Jeff's maxim's in life, you see... miserable people want you to be miserable too. The Governor ( who needs to be unelected) came down and met with the commercial guys and listened to them blame everyone including guys like me.....sheesh.....Statistically we catch nothing and we do a lot for the economy with that nothing and I don't believe the Governor has ever once met with us through the trials and travails of guided sport fishing. 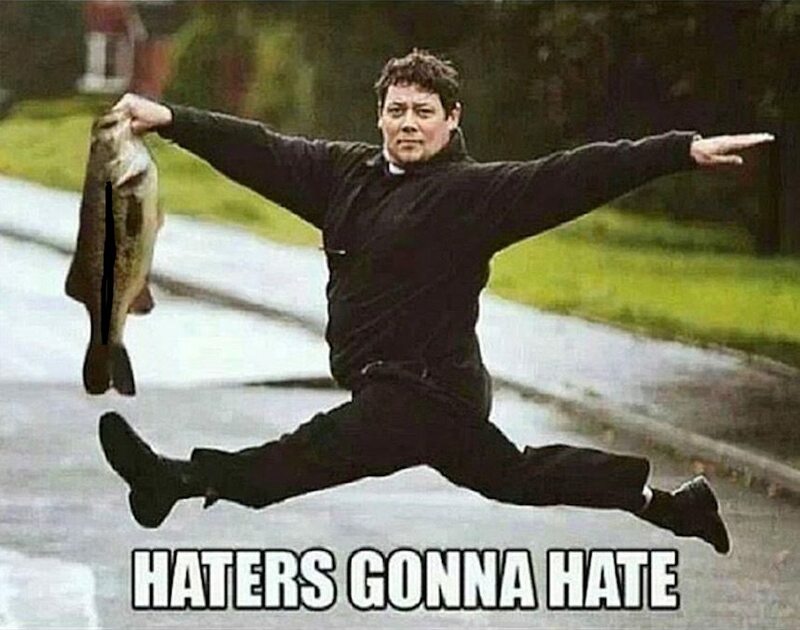 I don't know what it's going to take but our community will have to pull together sooner or later if we are to all share and respect each others fishery life styles....we might as well get started now if any of you are reading. But....this is what I see. That's me on my way silver fishing...And boy oh boy did my friend Seth get us started in the right direction. Our first silver of the year was an honest to goodness 14 pounder. I call him Super Seth because.....well, he is....About as good and eager as any fisherman I've ever met. You've got a wonderful life full of fishing adventures and fair chase ahead of you Seth, carry on buddy. So I hope you all come back to Mile 14 as we move into our fall season. Maybe you sense that this blog just doesn't have the ooomphaa it usually has....well, it' been a bit emotional for me to deal with all the weirdness's of rules changes and fishing closures, it's not how I imagined my last year of guiding. But that's in the rear view mirror now and we'll get our swagger back...I took this pic of my work bench that kinda tells the story of this lifestyle....complicated but simple at the same time, ya know what I mean ??? all of you that guide, I know you do. It only happens if you go fishing. The only guy who was completely negative about going catch and release fishing this last week was a single guy from Anchorage who I had scheduled to go with John and Deb Adams who most people would pay money to just hang around with. 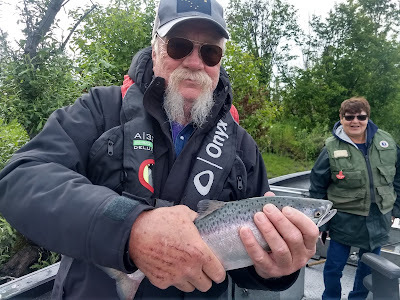 He said he only wanted to keep a salmon like he's already caught one....jeeeez....I won't miss dealing with guys like that next year when I'm retired. Here's ol #003 doing it's thing and letting ol slimey swim away. 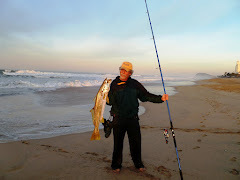 That fish was exercised by my old friend Ty Tobias on Friday and man-o-man it was a fighter. I snapped this pic of Ty fighting him not expecting that the best part was Jeremiah and Becca. We had a great day and this second shot is the magic...you've had ol slimey on for two good runs and although he's jumped it was far off and you really didn't get a good look...he's ready for the net and you finally see the silver flash in the perfect turquoise water and you gasp......it's a 40 pounder, gorgeous. 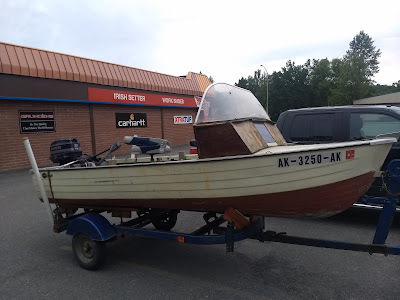 One of my old customers Bill Church was scheduled to fish on Tuesday. As screwed up as ADF+G is even they are sensitive to the fact that people need some notice when they change the rules so when they announced catch and release on Monday they made it effective Wednesday. 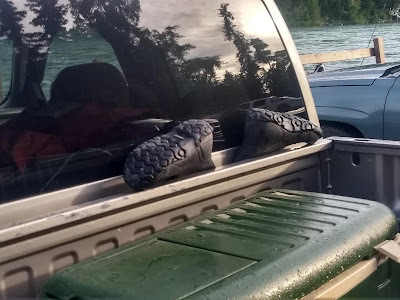 So Bill was wondering why I hadn't called him as he'd heard the river was C+R....just your usual confusion here on the Kenai. So he was surprised when his son George landed the first of the day and we took the Louisville Slugger to it. 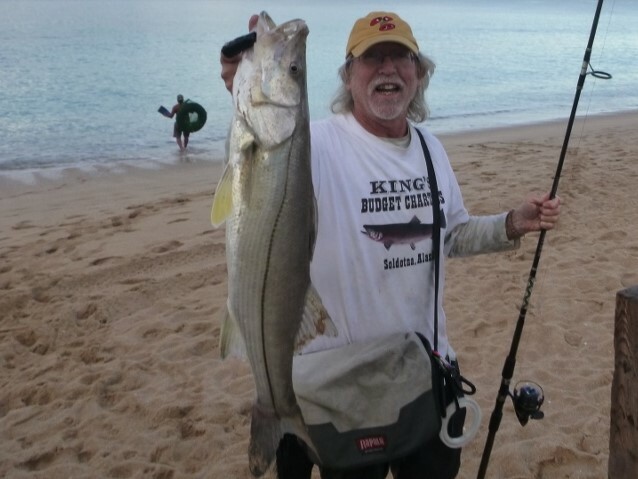 An hour or so later and the rod went off again and Bill's brother Ed caught a nice King. Here's me and him with the last dead King Salmon of my guiding career. I actually thought about that and it was no catharsis in my life just more of a bitter sweet deal...I wish it all made more sense. Through the years I've learned to be careful about booking people for several days, I usually just don't do it. If the fishing is good they catch an obscene amount of salmon and if the fishing is slow after the 1st day they're ready to kill you instead of the salmon. But John and Deb Adams break that model for sure, they're just wonderful and this year brought John's dad Bob along. 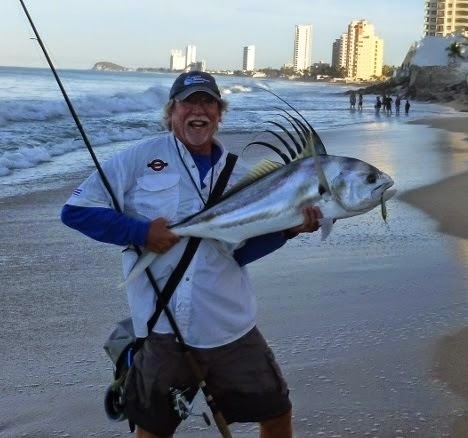 Here's Bob working out a fish before the release....nice. As you can see there are no boats around. The fishing experience is wonderful. 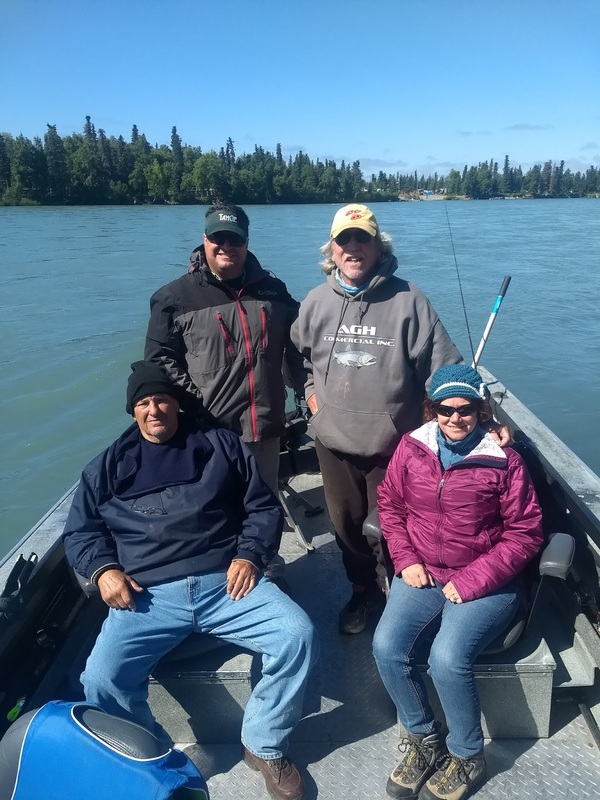 We went up to Soldotna one day and caught 25 trout or so just to shake up the fishing. 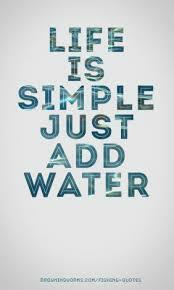 And wouldn't ya know the river delivered an eater to John. This is that week....want stress, go to the grocery store. Our town must have an extra 50,000 people here chasing red salmon and of course it's show time for the great american dollar here at Mile 14. I put the boat on the trailer and park it at the house whenever possible so MP can sell my real estate. This something I get a kick out of....yup, a budget motorhome. We see this quite a bit anymore but it never quits amusing me. Don't ya suppose it feels a bit like a prison cell in there when they close the door to go to sleep ? And in the salmon fever department this guy here is a friend of a friend like everyone here at Mile 14. 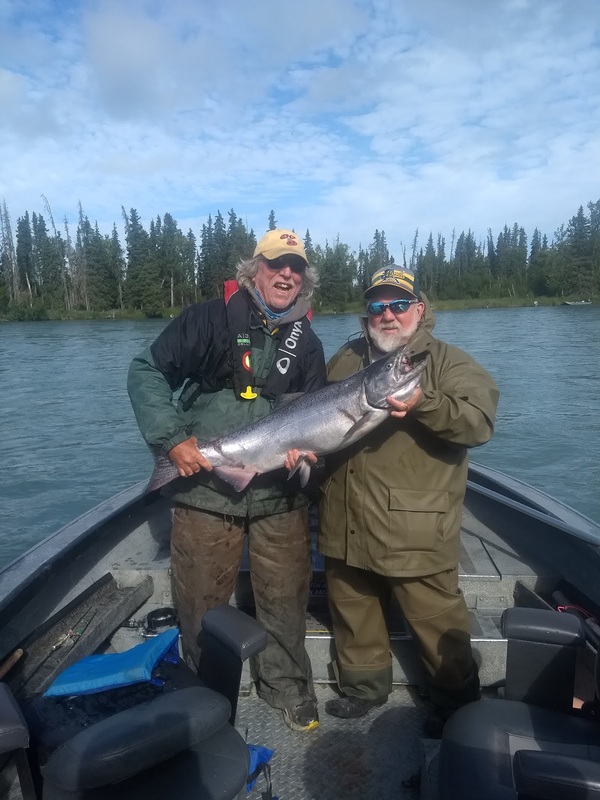 He was in hot pursuit of a large sockeye salmon when it spit the hook right in front of him. 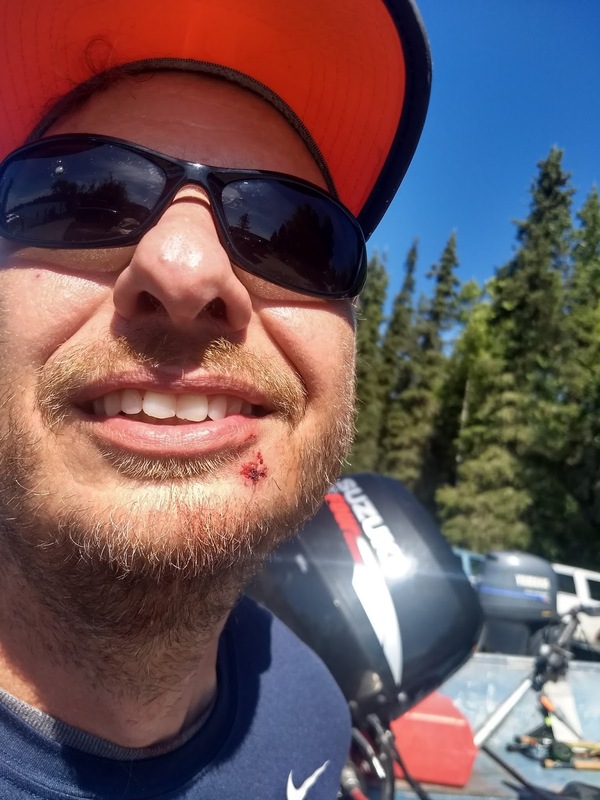 Of course the lure came flying at the source of the tension and he dodged the hook but got impaled in the chin by the swivel. Lucky for him his friend Beth Roukema is a Doctor so when it wouldn't quit bleeding she waded out to him with forceps and a suture and closed it up with one handy stitch....unbelievable is all I can say . I'd heard those stories. You turn 65 and things just start going wrong. I always thought that those stories were all part of the gag that is the ageing process....well, here I am at Central Peninsula Hospital on the day of my birthday, July 16th, having tests for just another speed bump along the way to eternity. Yep, I'm in the test booth of the pulmonary dept feeling a little like Herb Stempel in the movie Quiz Show. I burnt my lungs with Chlorine at our building in Mexico and they haven't been the same since. As is standard human 'guy stuff ' I muscled through it all spring until I had to use a rescue inhaler on July 1st....yikes, the day my medicare kicked in. So I've also heard about the guy who leaves the planet right when he finally gets his first Social Security check....I'm going to try hard to not be that guy as well. Ya know this day and age everyone is concerned about Internet security and identity theft. Well I kinda see it now, Google as nice as they were to greet me with birthday wishes it's kinda weird that they know and can do this so easily. 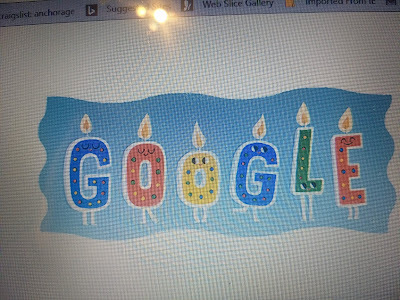 Thanks Google but hey, no offense but we really don't need to get personal. I had a great week of fishing. As the days went on the murky water changed into about as good as conditions you could ask for fishing artificial only. We really only had one bum trip. I had two runnung buddies in the boat that I really bonded with. 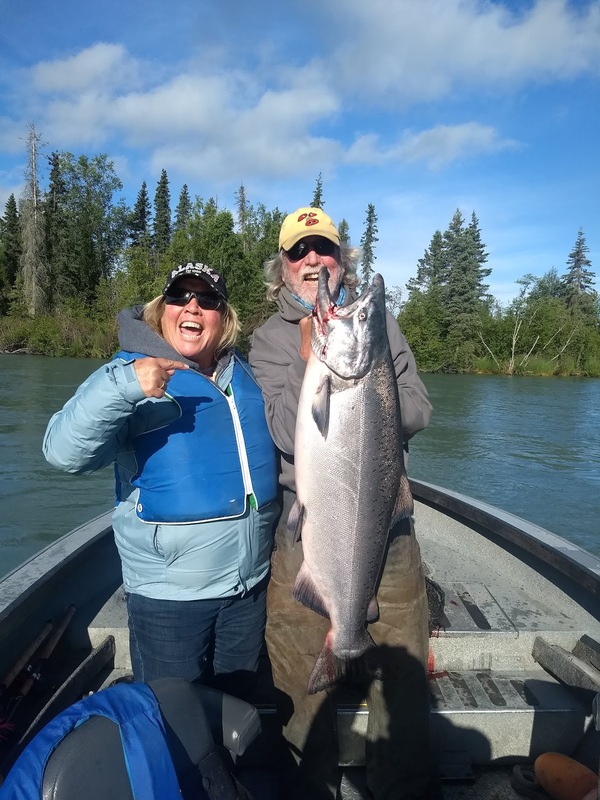 Amy and Leslie are married to a couple guys who don't fish so they came to Alaska a week before them to get it done. I laughed a lot. We had one fish jump higher than the one Amy caught but unlike this time that ones jump made the difference and he earned his freedom. At one time Amy kinda slumped ( I don't want to say fell ) onto the floor and held the rod up with one hand as Les helped her up....of course that was after it had to be free'd from a prop....but you can't argue with success. Thanks for coming you guys and especially this...how cool, she and I had had friendly banter before I ever actually met her. At 5:30 a.m. I got a caring hug from a complete stranger. As for this next week...well.....here's what I think. Our red run looks like this could be the year when the worm turns. 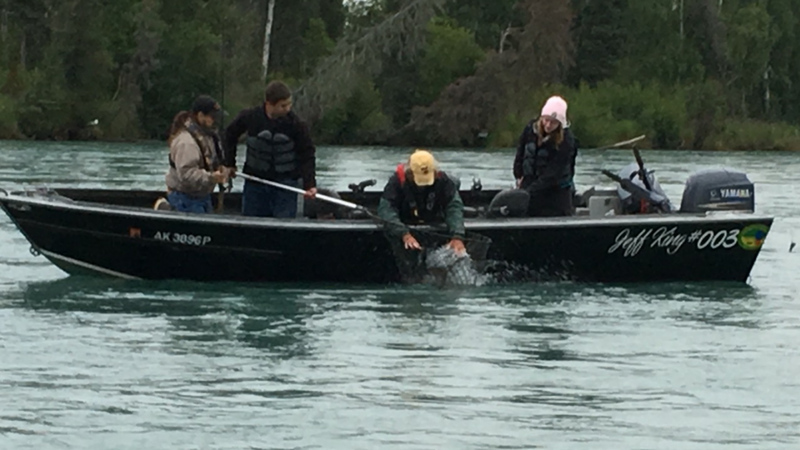 Sonar numbers for sockeye are horrible as is fishing success. So we need numbers soon but the temporary halt to the commercial fishery should help us get our King counts going in the right direction again. This week I expect pretty good fishing , then we'll see what happens. I sure hope ADF+G doesn't get in a situation where they have to explain why they let so much commercial harvest happen in the early season and why nearly 2000 King got killed when they would have put us into the middle of our escapement range instead of the lower end that we're headed to now. 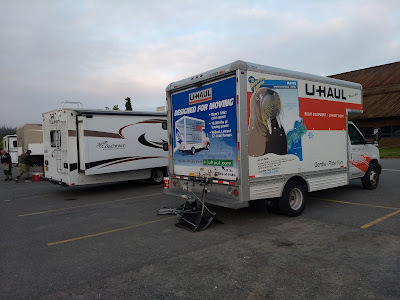 UPDATE...and a meer two hours after I published this edition of Mile 14. So what do I know ? 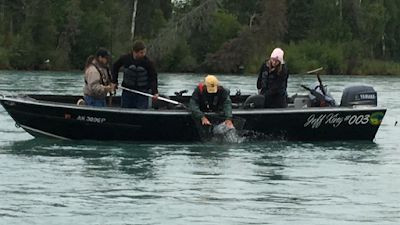 ADF+G just announced that we will have catch and release fishing only for King salmon either until we get fish or the season closes July 31st....It's true of course that we all want to protect the fish for the future...BUT...this is an absolute outrage. 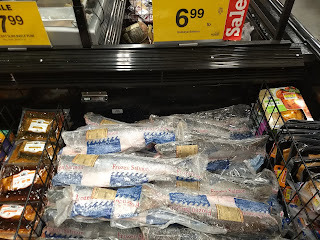 ADF+G before even assessing the strength of the Sockeye run allowed for ' emergency' orders letting the commercial guys fish extra time to the tune of 1800 and some REPORTED ( we all know there's more ) dead King salmon. Even half of these fish might have avoided our closure to keeping fish.....AND now we cannot retain Kings but the commercial guys still will be able to kill them....HOW is this conservation as they so stupidly throw that word around in the ADF+G emergency notice ??? With salmon runs failing all over the state we really need some help, some leadership, some fairness and some problem solving. We ain't getting none of that...if this continues, can you imagine Alaska without salmon ? Being a boat guy I just love the lines and the noble plan of a nice boat....but this time of year, the time where fish fever rules the day I notice ALL the boats and I get to thinking that this dip net fishery deal really needs a little safety chat. Ya know when I was on the Kenai Special Management Area River Board and the 21' size limit was proposed I mentioned that if we have a maximum size boat limit we should also have a minimum....ya know to avoid that deal where the guy at the gas station is holding court telling everybody how he damn near got swamped by a guide boat and you ask him what kind of boat HE has and he says " boat...hell it was a cattle trough until I put a motor on it. So....if you own this boat or one like it please read this. I know if you own these kinda things you want your dip net experience to look like this....DON"T DO IT. 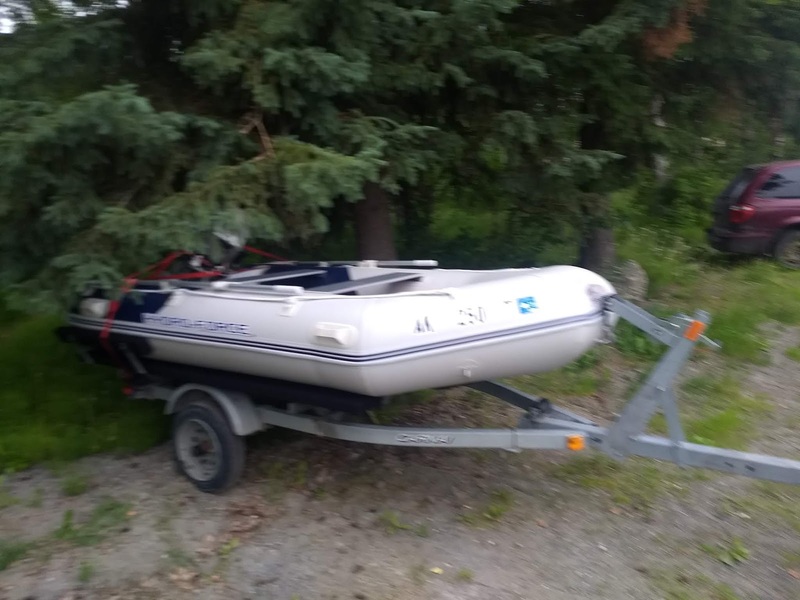 PLEASE, don't over load your boat. Where your life jackets. Have oars ready to deploy. Have a throw able cushion ready for your fishing partner. Avoid those blustery days at high tide....be careful, lets have a safe Dip Net season...and then go home ! And watch out for rocks....and PLEASE watch out for people sport fishing, like me. O.K., end of tutorial....Bet ya want a fishing report or at least what I think of the future of this King fishery in July. Well you heard it here first, it's going to be just fine. The sonar numbers are trending pretty close to last year which was exceptional. The bad news is that we've had a week of strangely balmy weather and the snow melt has put the river off. But, it'll clear everyday a bit this week and we're all going to have a real reasonable chance to catch ol slimey.....ADF+G is in a difficult position but of course they're the ones that put themselves there . 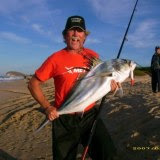 It was prudent to start us on no bait but now the question is fairness when the commercial guys are hard at it fishing 40 linear miles of net when they deprive us of a nice smelly sardine wrapped Kwikfish lure...Boy , we ask an awful lot of this July run of Kings and all in all it holds up. 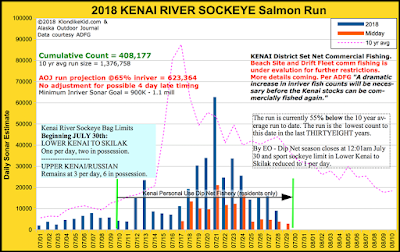 But we have snivelers and conspiracy believers but ol guide # 003 sees it this way--- The problem is NOT the fish that are returning to Cook Inlet, we're actually doing a pretty good job of spreading them around and protecting some for spawn... 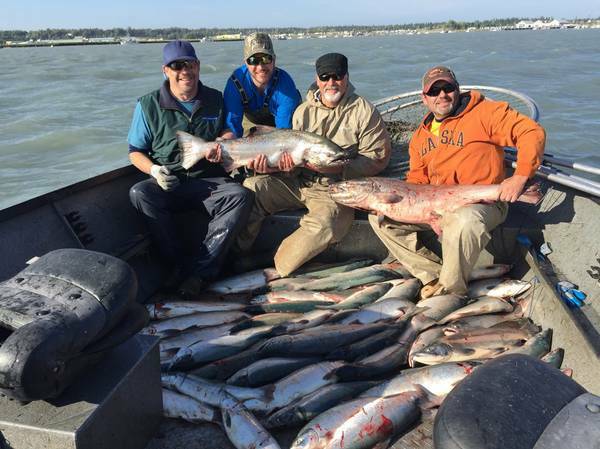 The problem IS, the fish that are NOT returning to Cook Inlet. The bulk of them intercepted or died off at sea. So please ADF+G, let's get busy solving this puzzle....remember, the first step in problem solving is to admit there is a problem. One of my neighbors found a use for our new signs...I like it. I don't think he's going to comply.